I installed the Toy Pony but I cannot find any of the cutie marks in the library or how to give this pony a cutie mark. Other than that I like this product. Guess the problem is that I was looking in 2012 library instead of the 4.5 library. So the cutie marks are only for 4.5 not 2012? Ah, I didn't realize it was Poser. I'm not positive, but I believe the markings use LIE, which would mean DS only. Plenty of lovely happy-horsey renders! KickAir 8P I just love the bear. Thanks! 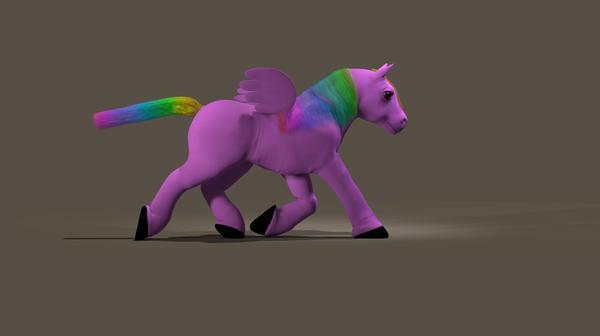 Iron Bear was originally supposed to be Iron Pony, but my attempts to make the texture map failed miserably — The DH2’s UV map may be excellent for realism, but not so good with the Toy Pony. Even simple quarter-marks distort, like that radiation symbol. I’ve got a number of super-heroes I’d love to do pony emulations of — if somebody could do a more toy-friendly UV with a seam guide I’d really appreciate it. Yes, the decals are made using LIE which afaik do not work in poser. once I get my computer set up at the new place I am going to try to figure out how to make decals in 2012.